Click image for interactive: See how the combined top rate in United States stacks up against those in other economies. It's a common complaint among some wealthy Americans: My taxes are too damn high. But they might feel a little better if they considered Denmark. Or many other economies where the top income tax rate -- factoring in both the national and local tax bite -- is higher than the highest combined rate in the United States and also hits people lower down the income scale. At 60.2%, Denmark last year had the highest top personal income tax rate among the 34 countries in the OECD, an organization of developed and emerging countries. And that 60.2% applied to income over roughly $55,000. That's a bigger bite than wealthy Californians face on their paychecks and other earned income. That top combined rate only kicked in, however, on income over roughly $400,000, which is more than seven times the Danish income threshold. In fact, only three OECD countries -- Korea, Canada and Spain -- imposed their top rates on an income level above that in the United States. The vastly different income levels at which top rates begin to bite is one reason why consideration of top rates alone doesn't offer a true picture of tax liability. The United Kingdom and Austria, for example, both imposed top combined rates of 50% in 2012, according to the OECD data. The United Kingdom, however, only applied that rate to income over $221,424. Austria, by contrast, applied it to income over $96,374. Another advantage in the United States: Seven states don't impose any state income tax, so the highest income earners there are only subject to the 39.6% federal rate. Their actual top rate would be lower if they deduct the state sales taxes that they pay. 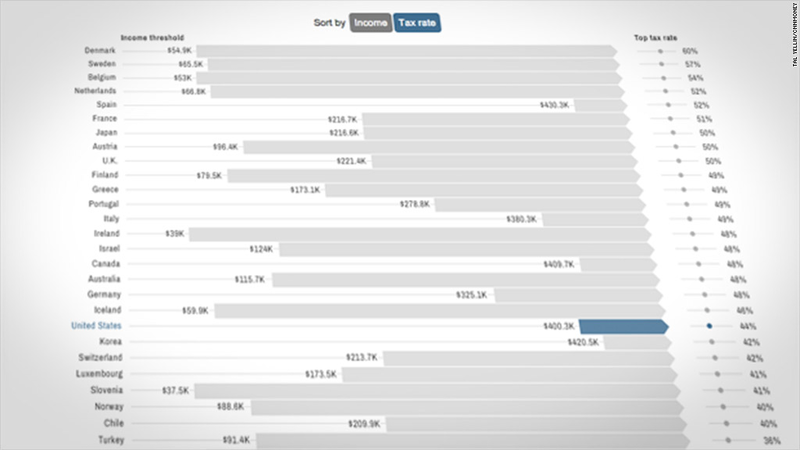 Related: Which state has the highest income tax rate? But even the top rate and income threshold factors offer only a partial view of tax liability. For instance, there are social insurance taxes -- such as Medicare and Social Security in the United States. And there's potentially one of the biggest tax hits to everyone's wallet -- sales taxes. Here again, Denmark takes the danish. At 25%, it imposes one of the highest national sales taxes in the European Union and the OECD. The so-called value added tax, or VAT, is applied to most goods and services. All OECD countries have a VAT, except for the United States. Here, how much one pays in sales taxes depends on where one lives. Sticking with the California example, the state imposed a 7.25% general sales tax in 2012 (food and prescription drugs were exempt). At the local level, up to 2.5% in local sales taxes were added to the tab. Investment taxes are another factor. So, too, are tax breaks, which can lower a high-income filer's burden. The issue of how much the rich should pay in taxes is a perpetual one. But the continued wrangling over deficit reduction and tax reform will keep it front and center in the United States over the next year.